If you are looking for an annual that adds height to the border Cosmos, with its ferny flowers and large flowers on tall stems could be the one. here we are are talking about, Cosmos bipinnatus which is grown from seed. This is an annual plant, however beware, as all varieties of Cosmos bipinnatus are not the same. The tall free flowering white variety Cosmos ‘Sensation’ is one of the best white varieties. Slightly lower growing is ‘Purity’ with very attractive white flowers.However if you are looking for lower growing types then Cosmos ‘Sonata White’ is a good alternative. ‘Picot’ – White flowers margined with pink. ‘Sensation’ – Tall growing with White, Pink or Red Flowers. Cosmos sulphureus – Tall growing to 1 metre plays with orange flowers. ‘Red Sensation’ – Tall to 1 meter in height, deep pink to red flowers. ‘Purity’ – To around 80 cm in height, white flowers. Cosmos is a plant that that adds height and interest to the summer garden. Tall stems holding aloft delicate and very attractive flowers make Cosmos a must for any sunny garden. These Cosmos varieties are the annuals, summer flowering and self seeding, although often planted as seedlings each spring. It is Cosmos bipinnatus that is most commonly grown, commonly called simply ‘Cosmos’ and also known as the ‘Mexican Aster’. Attractive ferny foliage and flowers ranging from white through to pinks and reds. These are a tall growing plant that can reach 2m in height, however many lower growing or dwarf cultivars are also available. It should be noted that C. atrosanguineus or ‘Chocolate Cosmos’ is sterile, it does not set seeds, so is only available as tube stock and larger plants. These are a tall free flowering perennial or annual with feathery foliage daisy-like flowers through summer to autumn. 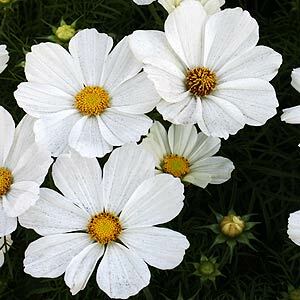 The White Cosmos (pictured) really adds a lightness to the garden, can be grown from seed and is well worth considering as a foil for darker plants in the border. We are looking for that warm sunny position and a humus rich soil that retains some moisture, a little protection from the hot afternoon sun can be beneficial. Because of their height these plants make a great plant for the back or any sunny border. Keep moist when planting out seed.